WASHINGTON (JTA) — I am trying to imagine a conversation between Donald Trump’s people and a delegation of Reform rabbis and lay leaders. Rabbi Jonah Pesner, the Reform movement’s man in Washington, told me that Trump’s people have agreed to a “staff-to-staff” meeting to discuss Jewish concerns about Trump’s policies on immigration, Muslims and women, to name a few. Pesner hopes it is the start of a long process of repentance – “teshuvah,” in Hebrew – for the real estate mogul and Republican front-runner. “Teshuvah is not a quick thing,” Pesner told me, during a break at this week’s American Israel Public Affairs Committee policy conference in Washington, D.C. “But we’d like to see real tikkun here,” using another Hebrew word that suggests repairing what’s broken. If I have trouble picturing this, it is because of the gaps in language between the two camps. Reform’s Religious Action Center, which Pesner heads, speaks the language of carefully crafted public policy and carefully chosen words of Torah. Trump speaks – well, Trump. Asking Trump to make teshuvah is a category error – much like asking AIPAC to speak in the language of the prophets when it comes to anything other than securing a safe Israel and a strong U.S.-Israel alliance. 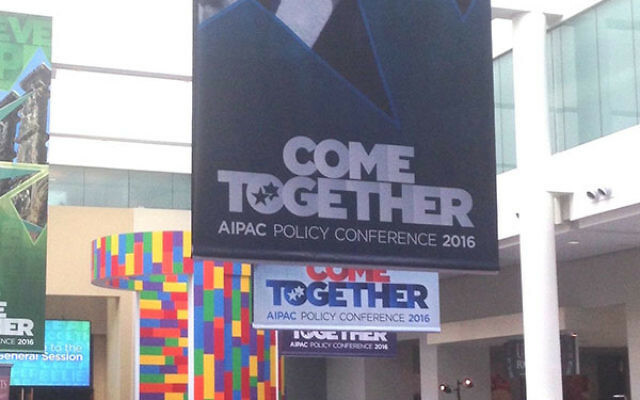 AIPAC isn’t a synagogue or a denomination. It is a single-focus organization whose focus happens to be one of the central elements of many Diaspora Jews’ Jewish identity: supporting Israel from afar. The strengths and challenges of that single focus were on display before and during this year’s conference, held March 20-22. The strength could be seen in the sheer fact of pro-Israel power and influence represented by the annual conference, a gigantic affair that sprawled across Washington, D.C.’s huge convention center and into its basketball arena. It could be seen in the roster of political grandees who came to pledge allegiance to Israel’s cause. And it could be seen in the enthusiasm of the 18,000 delegates who packed the Verizon Center, rushed among dozens of “breakout” session devoted to all things Israel, and then headed to Capitol Hill to woo their legislators on aid to Israel and keeping the Palestinians from seeking statehood outside the framework of peace talks. But for a lot of “delegates,” for whom support of Israel is so integral to their Jewish identity, the conference is another High Holy Day, or days. I spoke to members who were appalled by Trump’s speech and embarrassed by the enthusiastic reception for it, but they weren’t giving up on AIPAC. Pesner told me about the large delegation of Reform Jews at the conference, including college students, teens, rabbis, and leaders – including some who are active both in AIPAC and J Street, its putative ideological rival. The challenges of single-issue lobbying were seen in the invitation to and reception for Trump. In the days before the event, various rabbis and activists demanded that AIPAC issue some kind of statement condemning Trump’s most incendiary – and in their view, un-Jewish – positions. But AIPAC officials reminded them that, in the interests of bipartisanship and the U.S.-Israel alliance, AIPAC can’t afford to be as discerning as many would like – politically, spiritually or ethically. “Bipartisanship is the only way to make stable, sustainable policy from one election to the next,” said Howard Kohr, AIPAC’s executive director, in Sunday’s state of the lobby address. There are pressures on AIPAC to abandon this bipartisanship. Critics of the Trump speech – and those made queasy by the lobby’s cozy relationship with pro-Israel but deeply conservative Evangelicals – think a Jewish organization must stand up for a wide range of values, not just support for Israel. There is even more pressure from the right, whose activists and donors are convinced that the future of Israel support rests with the Republican Party. Observers like me left the Verizon Center wondering what it says about AIPAC when the Democratic front-runner gets a rousing ovation on Monday morning, and the ever-more-likely Republican nominee gets perhaps an even more ecstatic reception that evening. You could say that in any crowd of 18,000, you can find loud supporters on both sides. Or that under the rules of bipartisan lobbying, you cheer the ideas you agree with, and ignore the ones you don’t. As this crazily unpredictable election unfolds, however, the very premise of single-issue advocacy is going to be tested as never before.